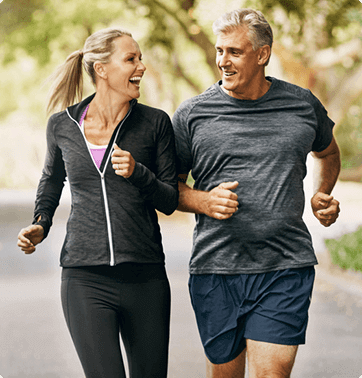 If hip replacement is in your future, you've come to the right place to learn about a truly significant advancement in joint replacement materials, VERILAST Hip Technology. Whether or not to undergo hip replacement surgery is a very important decision. No matter how statistically safe and successful hip replacement surgery has proven to be, every surgery has risks. Before making any surgical decision, conversations should take place with your family, your primary care doctor and your orthopaedic surgeon to make sure that hip replacement with VERILAST Technology is the right course of action for your particular situation. The results of laboratory wear simulation testing have not been proven to predict actual joint durability and performance in people. A reduction in wear alone may not result in improved joint durability and performance because other factors, such as bone structure, can affect joint durability and performance and cause medical conditions that may result in the need for additional surgery. These other factors were not studied as part of the testing. Hip replacement surgery is intended to relieve hip pain and improve hip function. However, implants may not produce the same feel or function as your original hip. There are potential risks with hip replacement surgery such as loosening, fracture, dislocation, wear and infection that may result in the need for additional surgery. Longevity of implants depends on many factors, such as types of activities and weight. Do not perform high impact activities such as running and jumping unless your surgeon tells you the bone has healed and these activities are acceptable. Early device failure, breakage or loosening may occur if you do not follow your surgeon's limitations on activity level. Early failure can happen if you do not guard your hip joint from overloading due to activity level, failure to control body weight, or accidents such as falls. Talk to your doctor to determine what treatment may be best for you. 1 Testing concluded at 45 million cycles. ISO 14242-1 defines test completion at 5 million cycles. 2 Australian Orthopaedic Association National Joint Replacement Registry Annual report. Adelaide: AOA; 2012.